Heat oven to 425°F. In 13x9-inch pan, place butter. Heat in oven 2 to 3 minutes or until melted. In shallow dish, stir Bisquick™ mix and pepper. Pour milk into small bowl. Coat chicken with Bisquick™ mixture, then dip into milk and coat again with Bisquick™ mixture. Place chicken in pan. Bake uncovered about 30 minutes or until juice of chicken is clear when centre of thickest part is cut (170°F). In small microwavable bowl, microwave barbecue sauce uncovered on High about 30 seconds or until warm. 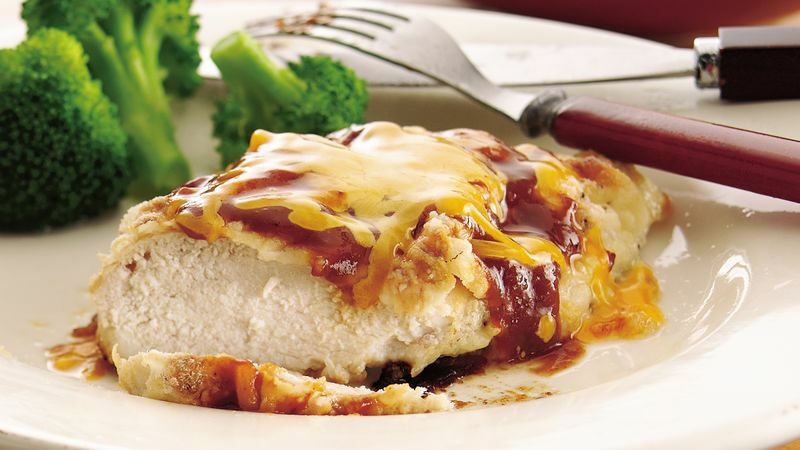 Spoon sauce evenly over chicken; top with cheese. Variation Serve in toasted buns for a meal on the go.